When we last saw Sir David Attenborough, he narrated a BBC nature documentary called Blue Planet II. While that one concentrated on aquatic topics, 2018’s Dynasties focuses on land-based animals. Each of the five episodes focuses on a different species. First we head to Senegal to follow a group of chimpanzees, and the second chapter takes us to Antarctica for time with emperor penguins. For Episode Three, we visit Kenya to meet a pride of lions. Episode Four goes to Zimbabwe for a painted wolf pack, while Episode Five finishes with a trek to India and a view of tigers. One issue I took with Blue Planet II stemmed from its general formlessness. As the series visited watery locations, it lacked much of a real arc to sustain the viewer beyond its stunning visuals. Those proved sufficient to make Planet worthwhile, and the shows also came with thematic elements to provide additional stimulation. Still, the episodes fared best as dazzling photography. With the creatures of Dynasties, though, we get a much clearer emphasis on potential storylines. Indeed, the title reveals that the series will attempt narrative elements, as it implies the animals will emerge via their family/social structures. This becomes the case, as Dynasties tends to pick specific clans and shows how they evolve. The view of the penguins feels more general, but it actually comes with the series’ most emotional moments. At one point, we see adult penguins as they attempt to reach safer territory, and one poor chick gets left behind. We view as this little guy struggles to follow but fails, and his probable death offers the most traumatic aspect of the series. Otherwise, Dynasties varies in terms of how it deals with tragedy. The episode about the wolves involves the most death, but otherwise the shows tend toward a more positive tone, which I think works. Not that I think a series like this should offer a happy-happy view of wildlife, but I think it makes sense to keep away from too much death and tragedy. The loss of that sweet little penguin chick is bad enough – we don’t need hours of that material! In any case, the stories on display feel like icing, as the main attraction of Dynasties comes from the nature of the photography. We truly get up close and personal with these amazing animals, and the shows boast many captivating sequences and insights. Blue Planet II brought a prettier show, as all that aquatic material allowed for intoxicating visuals. However, as I mentioned, Dynasties lends itself toward a stronger character/narrative thrust, and that makes it the more involving of the two. It may not look as lovely, but it brings compelling photography nonetheless. If we didn’t have to watch that poor baby chick struggle or that cute wolf cub get chomped, I’d love Dynasties. As it stands, I endorse the project, heartbreaking sequences aside. 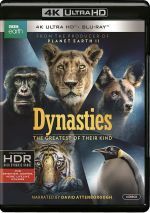 Dynasties appears in an aspect ratio of approximately 1.78:1 on these 4K UHD Discs. I expected a strong visual presentation and that’s what I got. Sharpness looked great. Virtually no issues with softness materialized, as this remained a tight, well-defined image. The episodes lacked shimmering or jaggies, and I saw no edge haloes or source flaws, either. A nature documentary deserved a natural palette, and Dynasties provided colors of that sort. A broad variety of hues cropped up in this lively, vivid set of hues. Blacks were dark and dense, while shadows seemed smooth and concise. I felt quite pleased with the series’ excellent picture quality. While not quite as strong, the Dolby Atmos soundtrack of Dynasties delivered good material. Downconverted to Dolby TrueHD 7.1, the soundscape mustered a fine sense of place. This meant the audio plopped us in the settings and habitats in a convincing, engulfing manner. These elements used all the channels in an immersive way, and the score also gave us good presence. Audio quality seemed solid. Music was lively and lush, while effects appeared accurate and dynamic. Speech appeared natural and distinctive. This was a consistently pleasing soundtrack that fit the material. A documentary called On Location goes for 50 minutes, 31 seconds. Narrated by Sir David Attenborough, the show features directors Rosie Thomas, Theo Webb, Nick Lyon and William Lawson, cameramen Mark MacEwen, Barrie Britton, Sophie Darlington, John Aitchison, Justine Evans, John Brown and Lindsay McCrae, camera assistant Stefan Christmann, anthropologist Jill Pruetz, animal trackers Henry Bandure and Nick Murray, and animal conservationists Krithi Karanth, Shivani Bhalla and Peter Blinston. As expected, “Location” takes us to the various domains to see the challenges involved in the project’s creation. Inevitably, some of this feels self-congratulatory, but we still get a good view of the circumstances in which the production worked. Disc One opens with ads for Blue Planet II and “Britbox”. The set also includes a Blu-ray copy of Dynasties. It provides the “On Location” documentary. 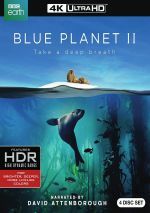 Note that whereas the Blue Planet 2 Blu-ray was sold separately, as far as I can tell, US customers can only get the Blu-ray version as part of this 4K UHD set. With a dynamic look at animals in their natural habitats, Dynasties gives us an up close and personal view of these amazing creatures. The series allows the viewer to invest in the critters and examine their lives in a compelling manner. The 4K UHD discs boast excellent visuals as well as very good audio and a useful behind the scenes documentary. Expect a collection of high-quality nature programs.